Demolition is underway at the Sonoco paper mill site, with plans to build 442 residential units and 14,200 square feet of retail space on the property, which sits on Boot Road and Route 322 in Downingtown borough. Downingtown Mayor Josh Maxwell stands at the site on Dec. 6, 2017. Downingtown Mayor Josh Maxwell's phone began buzzing. And wouldn't stop. It was a Tuesday evening in April 2016 and Maxwell was meeting with the board of Downingtown Communities That Care, a group of parents that works to combat opioid addiction and alcohol abuse in schools. Maxwell apologized, picking up his phone off the table. On the screen were texts and calls from residents; they wanted him to know what was happening. Maxwell's borough, it turned out, had caught Donald Trump's attention. Then-candidate Trump had been en route from a campaign rally at West Chester University that day when he passed the abandoned Sonoco paper mill on the corner of Boot Road and Route 322, a property just around the corner from the borough's main drag. "Passing what was once a vibrant manufacturing area in Pennsylvania," tweeted Trump. "So sad!" 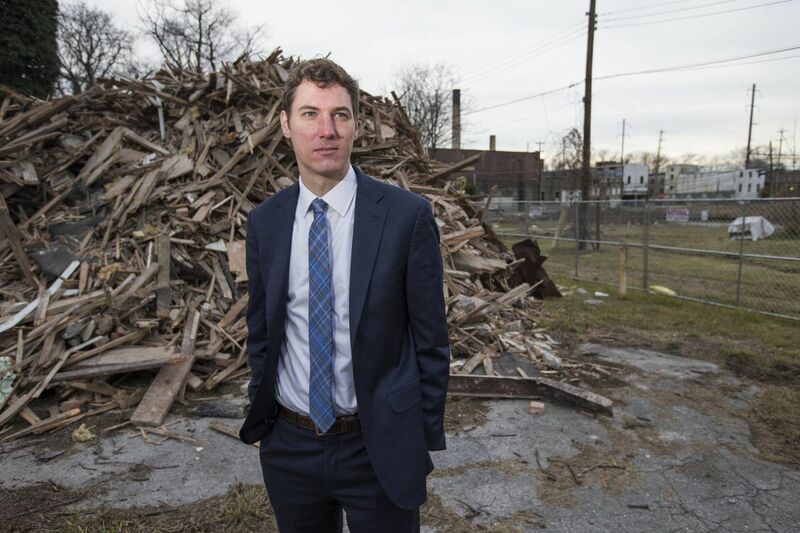 For Maxwell, a Democrat who has served as mayor since 2010, the tweet led to hundreds of messages and growing concern about the future of the dilapidated plant's redevelopment, he said. "What would this mean?" Maxwell recalled thinking. "Will the President continue to tweet about the project?" At the time, Maxwell was already in talks with developers, hoping to knock down the neighborhood eyesore and put stores, apartments, and a new train station in its place. The factory had sat vacant since 2005, when a fire shuttered the plant. Today, the Brandywine Station project is being billed as a "new gateway to Downingtown," officials said, with a future transit-oriented complex expected to include 442 residential apartments anchored by stores and restaurants, which will comprise more than 14,000 square feet of retail space. Last month, the Downingtown Borough Council gave the Hankin Group, an Exton-based developer, the green light to begin demolition on the 68-acre property. They are expected to spend about $150 million on the redevelopment, according to planning documents, a figure that would mark the largest private investment in Downingtown's history, Maxwell said. Along with apartments and retail, the complex is also set to include a pedestrian bridge over the Brandywine River, a proposed connection to the Chester Valley Trail, and a new SEPTA/Amtrak station, officials said. "This was a site location selected in a previous planning study. We are working through the planning process for a new train station here," PennDot said in a statement. "We are encouraged by the interest from developers about the area around the station." A rendering of the proposed transit-oriented residential and retail development planned for the site of the former Sonoco paper mill plant. It could be a year before construction approvals are complete, Hankin Group executives said. "We are in the very early stages of planning and land development," said Neal Fisher, vice president of development. "It's a planning effort that will take some time." But the site's potential is exciting for the company, which also developed the Eagleview Town Center and the under-construction Keva Flats apartments, both in neighboring Exton. This is a row of live-work buildings along the Eagleview Town Center, which The Hankin Group developed.in Exton. Credit: The Hankin Group. The Sonoco plant property's proximity to downtown, the Brandywine Creek, and open space made the lot especially attractive. "Building it around the principles of town-building is our biggest priority," said Hankin Group CEO Robert Hankin. "We have worked hard to make sure what then-candidate Trump assumed did not happen," said State Sen. Andrew Dinniman (D., Chester County), who toured the site with Hankin Group officials last month. For over a decade, the buildings were not only an eyesore on the way into the borough; they were also unsafe. Children would often enter the abandoned property, as would photographers, and artists looking to add to the elaborate graffiti that covered the walls, Downingtown Police Detective Paul Trautmann said. One night in December 2015, Trautmann said, a group of kids entered the building, saw what they thought was a body, and flagged down police. A 28-year-old man, who had been known to enter the building to take photographs, appeared to have tripped on a wire on the building's second floor, fell through an opening, and died of blunt-force trauma, Trautmann said. "The place was an artwork" of graffiti, Trautmann said. But "I like to see progress in this town. I'd like to see the town go further." For some Downingtown residents and business owners, this project epitomizes a suburb transforming. Bill Covaleski founded Victory Brewing Co. in Downingtown in 1996. He and his business partner were attracted, in part, by the fact that the area had once been home to paper mills; the mills left behind an excess capacity to handle wastewater, which breweries produce a lot of, he said. Over the last two decades, not only has Victory succeeded, but Covaleski said he has also seen the surrounding community improve, with restaurants, businesses, and young people flocking to the area (Maxwell said nearly one-third of Downingtown's residents are younger than 35). Knowing the Hankin Group's past work, Covaleski looks forward to the Brandywine Station project, he said. "I believe the plan is a very smart one." Michelle Kichline, the Republican chair of Chester County's Board of Commissioners, said she sees parallels between Downingtown and Phoenixville, a former steel town whose downtown has been revitalized in recent years by an influx of restaurants. "Keystone businesses," such as Victory, have already made Downingtown more vibrant, Kichline said, and the proposed Sonoco plant development would contribute to its walkability. "Even as President Trump noted, [the Sonoco plant] was a symbol of decay," Dinniman said. "Myself and the citizens of Chester County can now tweet back at President Trump: 'We've turned things around.' "
"We'd certainly love to have the president back here," Kichline said, "to see some progress in Chester County."